Titanium is still a little known material in the nautical world, but is already widely used in the two and four wheel racing sector thanks to some of its important mechanical features. It is a valid alternative to steel thanks to the fact that it is about 45% lighter and in some cases as much as 70% because of the mechanical characteristics of its alloys. Furthermore, one of the mechanical characteristics of titanium alloys is its low modulus of elasticity, 110 Gpa as opposed to the 220 Gpa in steel. This means that it is more elastic and therefore capable of offering greater resistance under any kind of stress. Unfortunately, the tribological properties of titanium are not exactly outstanding, and have a high friction coefficient when in contact with other materials, easy seizure and a high level of corrosion from scraping, especially in low oxidative surroundings. It is, therefore, presently a questionable property, using modern technology and adopting, for example, surface treatment such as PVD or ASD (Anodic Spark Deposition) anodisation. The Italian company Poggipolini, has specialised since 1975 in working with light materials such as titanium and aluminium and has achieved a high standard of competitiveness at international level. This means they are now linked as suppliers to well known names in Formula 1, MotoGp and Superbike. Nowadays, the company has a modern range of machinery for precision turning, milling, rolling threads both hot and cold and a consulting and design technical assistance department with CAD/CAM systems. It has also expanded its target into the aerospace sector and above all, the nautical industry. 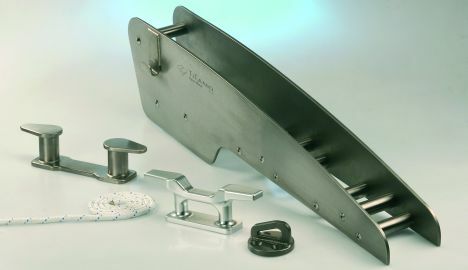 In this specific field, titanium can undoubtedly be successfully used thanks to the positive aspects mentioned above and because it is particularly resistant to corrosion at sea. Unlike other material, titanium is less likely to become covered in seaweed and deposits especially if treated with special coatings or if there are small amounts of copper in the chemical composition of its alloy that make it highly suitable for the production of parts to be installed in the hull bottom. Another of this material's qualities, already greatly appreciated in other sectors, are the bright colours with great visual effect obtained thanks to an electrochemical process known as anodic oxidation that opens up the road towards the creation of both internal and external decorative items. Titanium is found in large quantities on the Planet in the form of oxide and is unfortunately an expensive material, firstly because in order to bring it to the state and form in which it can be used, sophisticated production processes are required (it is reduced from titanium dioxide to metal titanium and then it undergoes vacuum fusions); secondly, because there is an increasing demand for quality steel where titanium is used as an alloy element and the increasingly important aerospace market. In any case, even though it is an expensive material, its numerous qualities mean it is of particular interest to the nautical industry. For further information: Poggipolini; via Emilia 262; 40068 San Lazzaro di Savena (BO); tel. +39 051 6256090/6258160; fax +39 051 6259126/6257084; web site www.poggipolini.it; e-mail info@poggipolini.it.